Downtown Secrets is rated 3.9 out of 5 by 13. Rated 5 out of 5 by sapoe from just good I played this one when it first out and I never leave a review before. For this I give 5 stars because I have fun 'til the end and good storyline. There's a lot HO so if you are like this kind genre or if you looking a game for spending your lazy time then try this one. Thanks dev! Rated 5 out of 5 by mspaws from Hog!!!!! Yes I loved this game due to the fact that it was a true HOG! Nice interaction between the characters, graphics good, storyline was easy to follow. Rated 4 out of 5 by Sunshine566 from A fun game I liked this game, HO's are great, graphics are dark. However, I would not buy it again. 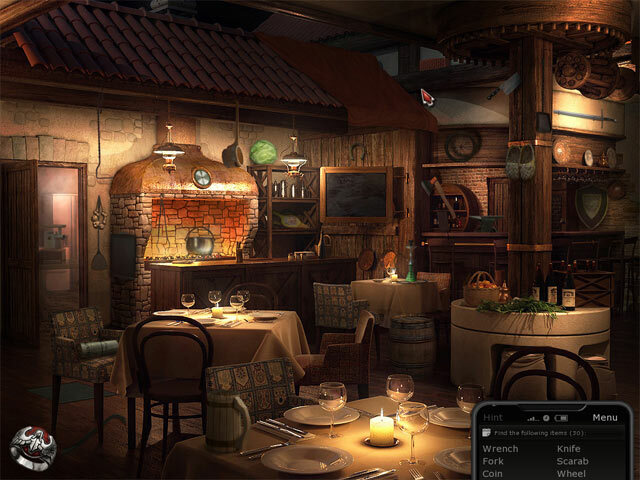 Rated 4 out of 5 by hermitcave from A little different approach to hidden object who done it Alex, a defense attorney, had a girlfriend, Marie, who left him three years ago and disappeared. Now, three years later, she calls him out of the blue and asks for his help. She has been arrested for murder and he is the only one she trusts to help her. Alex's friend, Nick, is a private eye and decides to help Alex with his case. Marie has asked Alex to remove some documents from the crime scene before the police can find them and deliver them to a contact for her and you find out she is a corporate spy dealing with some shady characters and a organization called Chimera. Marie's fate hinges around a mysterious ring that has the ability to allow the user to review past events. The story was ok but a little out there especially with Marie disappearing for three years and Alex dropping every thing on a phone call from her asking him to remove evidence without any information. The game is kind of a who done it with mulitple sites to visit and things to do in each scene. There are seek and find items to collect and some are used to solve puzzles. Using the mysterious ring was a nice different way to do a list. As you move around the scene invisible objects become visible so you can click on them. Some items are very small or partially hidden or behind a grate so you have to look closely. Most items are in the scene you are in but there can be inserts such as cupboards, drawers, etc that may contain some items. Just look for the cursor change. 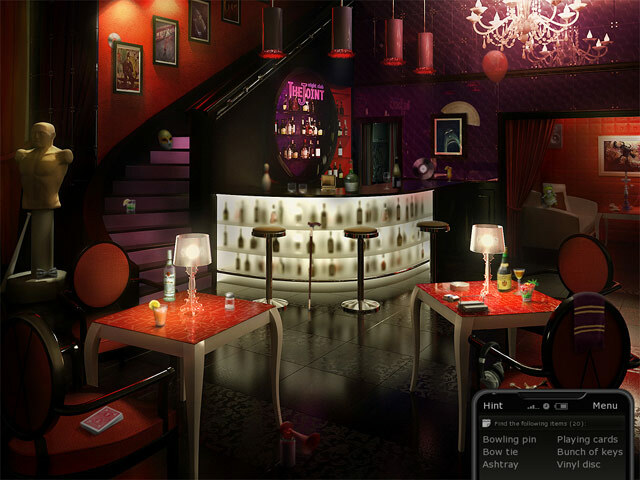 Each character encountered has a dossier that provides information on the character. Din't find it especially helpful but gives the game a feel of intrigue. There is no map as travel to new locations are automatic. There are no voiceovers so you had a lot of dialog boxes to read. Music was ok but repeated. Graphics and animation was good but 2010 vintage so don't expect any thing great. The ending was ok with Alex and Marie escaping but the villians get away. Maybe to be seen again in a sequel? I didn't really dislike the game but didn't find it as memorable as others. Rated 4 out of 5 by pennmom36 from Downtown Secrets This is actually a decent game with a who-dun-it vibe. My only complaint is that some of the hidden objects are small and difficult to identify. Alex is a criminal attorney who receives a call in the middle of the night from Marie Vernet, the woman who left him three years ago without any explanation. She informs Alex that she has been arrested for murder and desperately needs a favor...a criminal favor! She wants Alex to visit the crime scene and remove documents before the police find them. When he arrives at Mark Brandt's house, the scene of the murder, he is surprised that an old friend turned private detective is there as well. Turns out his friend Nick is involved in this case as well, and naturally wants Alex to help him out as well! Things just keep getting more complicated and everyone is under suspicion.....just who killed the multinational CEO? You will be equipped with a Dossier which can be accessed on the right of the screen, and all the information is stored there with bio's on each person you make contact with throughout the game. 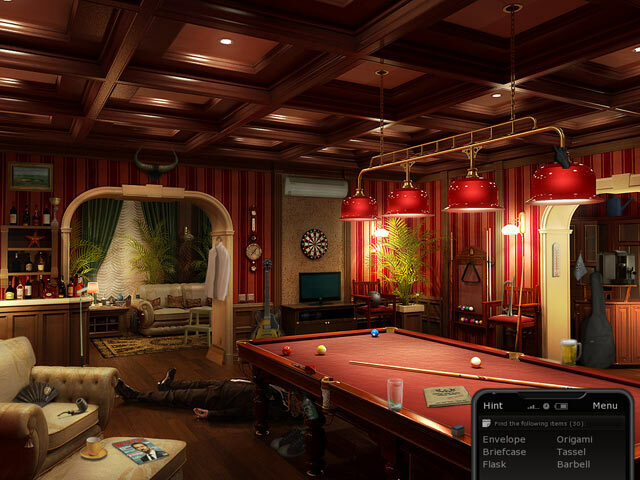 Each location you come across will have a hidden object list find and at least a couple of interesting mini games, which require codes and keys that you find in that location. I really enjoyed the game of finding the correct safe code using a bookmarker with several holes cut out, requiring you to scan the bookmarker over pages in a book until you found the correct placement of numbers. This game has decent graphics, keep in mind this game was released in 2011. There are no voiceovers, but at least there aren't a billion dialog boxes to read, once the introductory story has been told, enjoy! Rated 4 out of 5 by DiDi212 from I Really Liked This Game! This came up in my "games you might like" so I downloaded and decided during the demo I just had to buy it (with a coupon of course) to see how the story ended. It's a detective story -- but the main character is a lawyer who is called by a previous girlfriend to come see her in jail where she's being held on a charge of murder. I wish there had been voice overs because there is a lot of dialogue to read. You travel from scene to scene mainly solving HOS but the dialogue keeps you interested in this adventure story. The hint recharges quickly and I had to use it a few times. Some of the items are very small and therefore hard to find. There were several puzzles of which I skipped the majority for lack of understanding what I was supposed to do but the skip loads fairly quickly. The puzzle isn't solved for you to see so I still don't know how to do them. Play the demo and read some reviews. For me I liked it enough to buy and I'm not sorry I did. It was a little short, but a very enjoyable game. Different from the usual. Rated 4 out of 5 by Hookedonbigfish from Entertainment laced with intrigue and a dash of drama Marie has been arrested for murder and calls on Alex whom she broke up with three years ago to help her find out what the Downtown Secrets involve. The dialogue is quite adequate but tends to be a little overdone in some cases, but does not distract from the game too much. The graphics started a bit on the dark side at the beginning of the game but they seemed to get a little brighter as the story moved on. This made the hidden objects a tad hard to find at the start but with concentration and a bit of effort improved a good deal and made the task of locating the bits and pieces a lot easier as the game progressed. The pulsating ring invoked scenes from the past and made a pleasant diversion from the standard search and click genre. This was an entertaining game laced with a bit of intrigue and contained a dash of drama just to top it off. Rated 4 out of 5 by BibiBuggs from Thoroughly Enjoyed It I have only tried the trial version but intend to buy this game. Yes, it is pretty much HOG but is still fun nonetheless. Storyline is also enjoyable. If it is almost entirely HOG's you like (keeping in mind I have only completed the trial version but I did get quite far into it), then I don't think you will go wrong.